The United States Census of 1790 was the first census of the whole United States. It recorded the population of the United States as of Census Day, August 2, 1790, as mandated by Article I, Section 2 of the United States Constitution and applicable laws. In the first census, the population of the United States was enumerated to be 3,929,214. 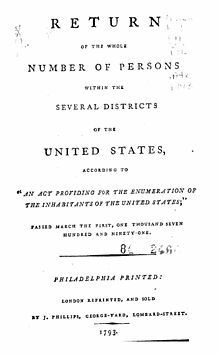 Congress assigned responsibility for the 1790 census to the marshals of United States judicial districts under an act which, with minor modifications and extensions, governed census taking until the 1840 census. "The law required that every household be visited, that completed census schedules be posted in 'two of the most public places within [each jurisdiction], there to remain for the inspection of all concerned...' and that 'the aggregate amount of each description of persons' for every district be transmitted to the president." Both Secretary of State Thomas Jefferson and President George Washington expressed skepticism over the results, believing that the true population had been undercounted. If there was indeed an undercount, possible explanations for it include dispersed population, poor transportation links, limitations of contemporary technology, and individual refusal to participate. Although the Census was proved statistically factual, based on data collected, the records for several states (including: Delaware, Georgia, New Jersey, and Virginia) were lost sometime between 1790 and 1830. Almost one third of the original census data have been lost or destroyed since their original documentation. These include some 1790 data from: Connecticut, Maine, Maryland, Massachusetts, New Hampshire, New York, North Carolina, Pennsylvania, Rhode Island, South Carolina, and Vermont; however, the validity and existence of most of these data can be confirmed in many secondary sources pertaining to the first census. No microdata from the 1790 population census are available, but aggregate data for small areas, together with compatible cartographic boundary files, can be downloaded from the National Historical Geographic Information System. At 17.8 percent, the 1790 Census's proportion of slaves to the free population was the highest ever recorded by any census. ^ The census of 1790, published in 1791, reports 16 slaves in Vermont. Subsequently, and up to 1860, the number is given as 17. An examination of the original manuscript allegedly shows that there never were any slaves in Vermont. The original error occurred in preparing the results for publication, when 16 persons, returned as "Free colored", were classified as "Slave". But this claim is disputed by at least one historian. ^ Corrected figures are 85,425, or 114 less than the figures published in 1790, due to an error of addition in the returns for each of the towns of Fairfield, Milton, Shelburne, and Williston, in the county of Chittenden; Brookfield, Newbury, Randolph, and Strafford, in the county of Orange; Castleton, Clarendon, Hubbardton, Poultney, Rutland, Shrewsburg, and Wallingford, in the county of Rutland; Dummerston, Guilford, Halifax, and Westminster, in the county of Windham; and Woodstock, in the county of Windsor. ^ The figures for Massachusetts do not include the population of Maine. Though Maine was then a part of Massachusetts, the Maine figures were compiled separately, and are shown on the line for Maine. ^ Corrected figures are 59,096, or 2 more than figures published in 1790, due to error in addition. ^ The figures for Virginia do not include the population of Kentucky. Though Kentucky was then a part of Virginia, the Kentucky figures were compiled separately, and are shown on the line for Kentucky. The Virginia figures do include the portion of Virginia that later became the state of West Virginia. ^ "History: 1790 Fast Facts". U.S. Census Bureau. ^ a b "History: 1790 Overview". U.S. Census Bureau. ^ "1790 Overview". U.S. Census Bureau. ^ Dollarhide, William (2001). 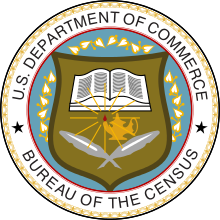 The Census Book: A Genealogists Guide to Federal Census Facts, Schedules and Indexes. North Salt Lake, Utah: HeritageQuest. p. 7. ^ "1790 Census". 1930 Census Resources for Genealogists. ^ "1790 Census of Population and Housing". U.S. Census Bureau. Archived from the original on May 12, 2015. ^ a b "A Century of Population Growth from the First Census of the United States to the Twelfth, 1790–1900". 1909. p. 47.